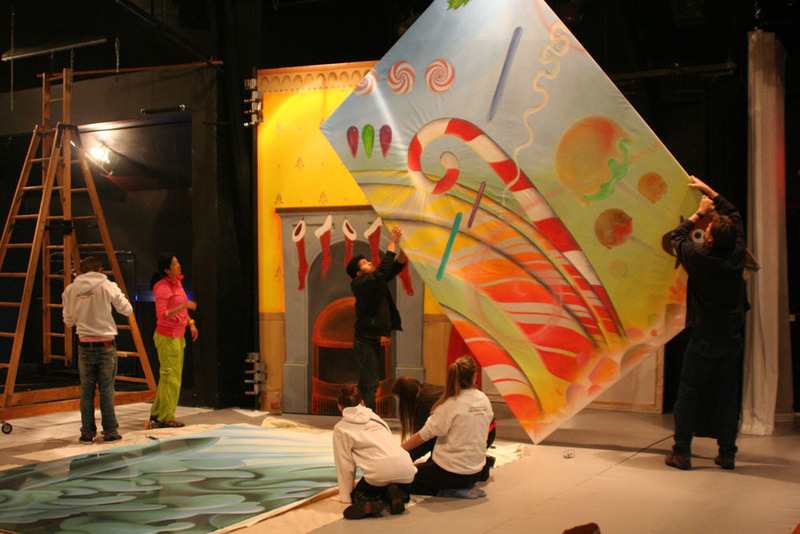 On stage with Paints, creating the worlds for your entertainment! Cody lays color to movie props, stages, and sets, and the players themselves! 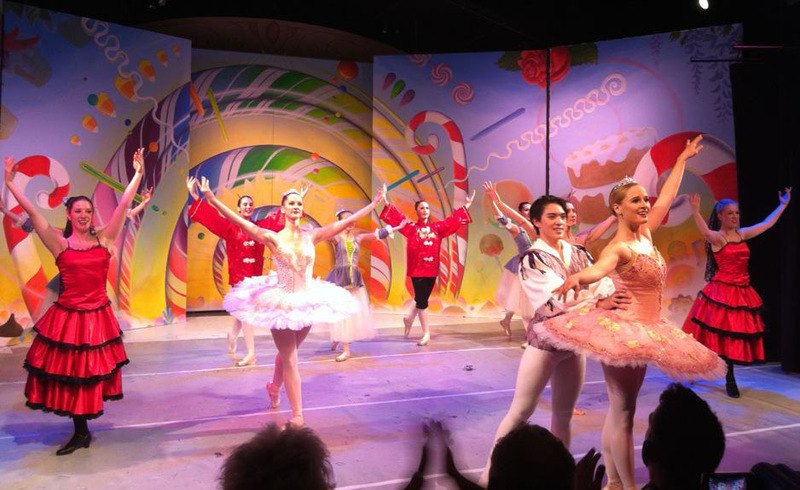 Come in and see some of the wonderful, magical scenes! 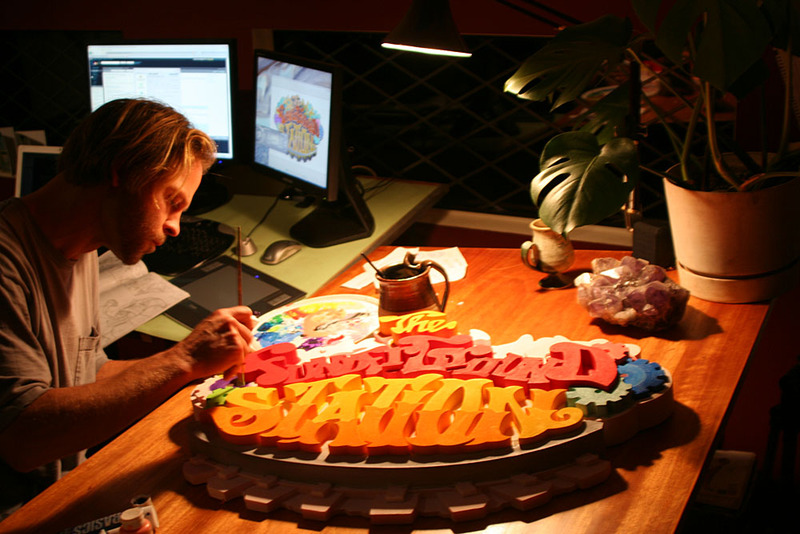 His work brings him up and down the west coast of North America, Vancouver, Mendocino, San Francisco, Santa Cruz. 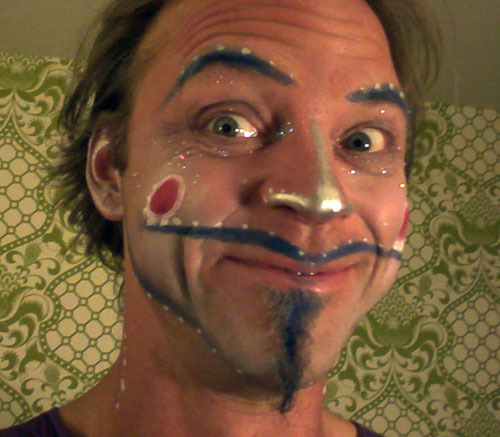 For one instance he was called to design and paint the Circus Vardo for Flynn Creek Circus! It`s a human spectacle show involving knives, trapeze, clowning, strong man and much more. Just not any animals…get it. 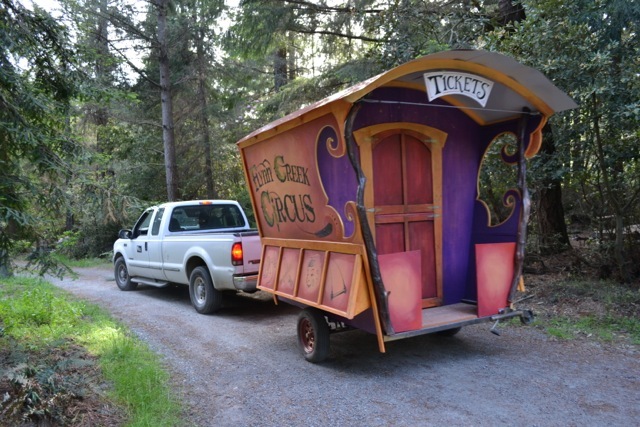 The Vardo would first be pulled into town to represent the coming attraction, and sell tickets. A week later the big top would arrive with all it`s hustle and bustle. They would set up, crowds would arrive, and action! The Funderground Station and the Fungineers at Dreamberry studios were creating amazing content to laugh with. Zany costumes, crazy puppets, and Kirian (amazing musician/beat boxer). This sign was sketched by a Xavi, then scanned and digitized into the computer. Then it was CnC milled out of foam block….and then I painted it. That;s just one of the many creations I did there for them. What a time! Of course there is always my FACE! An ever changing canvas of fun. The paint! The hats! The accessories! The expressions and drama that plays out is virtually a show unto it self 😉 But that’s not all, oh no! I paint kids faces, other peoples bodies, clothes, I paint anything! Hah! I’ll even come over there and paint you.